It's September. And when the month ends in "BER", I also automatically think of Christmas. So, as early as now, I am already thinking of what to buy for myself as a gift. Actually, this is something I've thought about over 3 years ago. I was close to buying it when my first daughter was still a baby, then things got busy until it slipped my mind. What is it? A household sewing machine. 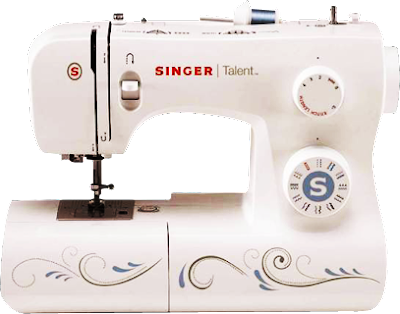 Singer Talent 3323. I want my own sewing machine too. But I'm not good at sewing so I guess a portable one would do just fine for me. If you have no use for your portable sewing machine let me know. hahaha! No dear. I bought Brother JS-1410 instead. But if you need to know how much is a Talent, try to call Singer Philippines' importer and distributor at telephone no. 362.0712 or 413.0410.